We have four new members to welcome to the Sessions lab this fall: postdoc Elise Wilkes, and 1st-year geobiology students Makayla Betts, Elliot Mueller, and Shae Silvermann. This influx nearly doubles the size of our group, which is fabulous but also leaves me wondering if we will have enough hood space… You can see their smiling faces here. 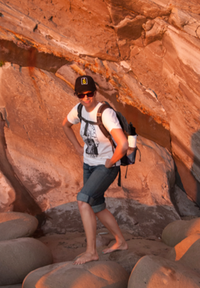 In August, we also bid farewell to Laurence Bird, a postdoc in the group over the past 18 months. 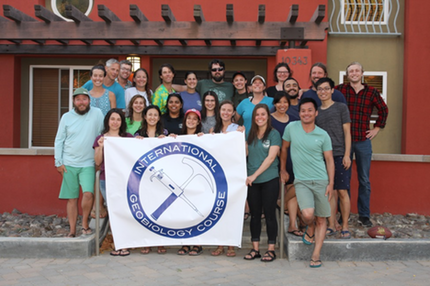 Laurence has moved on to a position with the US Geologic Survey in Reston, VA.
For the second year in a row, Victoria Orphan, Woody Fischer and myself ran the 5-week summer International Geobiology training course, for graduate students and postdocs. 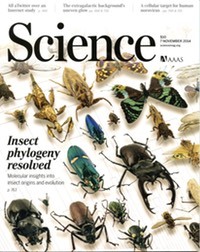 This whirlwind of activity included field work in Mono Lake, the Eastern Sierras, and on the coast near Ventura; at least 10 separate lab rotations at Caltech, including stable isotope mass spectrometry, synchotron X-ray spectroscopy, nano-SIMS, and others; and 11 days of learning and working with our data at the Wrigley Marine Science Center on Catalina Island. We had a blast with this amazing group of 16 students (see above) and made many new friends. We’ll be doing the course again in summer 2019, if you are interested in attending there is information posted here. 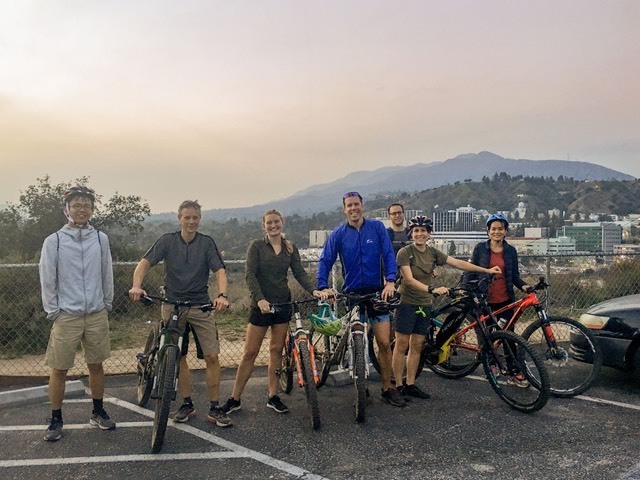 We have a relatively active group of students and postdocs in the Sessions Lab, and they have been claiming for quite a while that they wanted to go mountain biking. So this past week I called their bluff, and we took a group mountain bike trip up Brown Mountain (a ~1000-foot climb), and down the famous El Prieto trail (think steep, rocky single track). Followed of course by lasagna and home-brew for dinner. I’m happy to report that everyone survived with no trips to the ER. We did have a couple superman imitations, and one roll in the poison oak, but they’re all fine… Can you guess from the picture who was riding an e-bike? On May 6, Morgan successfully and impressively defended her Ph.D. thesis, titled Organic Matter Sulfurization in the Modern Ocean. We went for the record, grilling her for nearly 3 full hours, which she survived with flying colors. As of June 10, 2016 (graduation day at Caltech), she is officially Dr. Raven. She will move on to a postdoc position with David Fike at Washington University of St. Louis at the end of the summer, as an Agouron Postdoctoral Fellow. 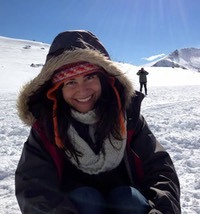 Jessica Hinojosa joins the research group this month as a GPS Chairs Postdoctoral Investigator and AGEP Fellow. Jess will be working on leafwax D/H paleoclimate records of the Southern Hemisphere, based on sediments from fjords and lakes in New Zealand. Jess recently completed her PhD at the University of Otago (Dunedin, New Zealand). Welcome to LA, Jess — you can take your coat off now! 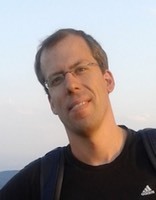 This month we welcomed Reto Wijker, the latest postdoc to join the group. Reto comes to us from EAWAG in Zurich, Switzerland where he did his PhD working on stable isotope records of microbial contaminant chemistry. At Caltech, he will be working on our project to understand microbial D/H fractionations. 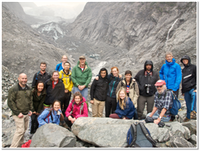 Field trip participants pose in front of the Franz Josef glacier on a typically sunny(?) day. At least there are no sand flies up here. Trevor Chinn, bottom right, was our local guide. This spring, I had the good fortune to lead (along with John Eiler and Mike Lamb) an international field trip to the south island of New Zealand. We took 11 graduate students and 2 undergrads. We started in Christchurch, drove over Arthur’s Pass, down the west coast, back through Haast Pass, down to Queenstown and Te Anau, and back. Over the course of 10 days we saw recent earthquake damage in Christchurch, metamorphic rocks and active landslides in the Alps, podocarp forests and temperate mountain glaciers (and sand flies) on the West Coast, glacial geomorphology around Queenstown, and … of course … Milford Sound. It was the trip of a lifetime, so thanks to all those who made it possible! 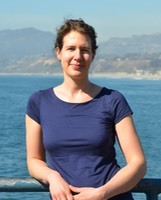 Stefanie Wirth, a postdoc in our group for the last two years, heads back to Switzerland this month to take up her new position as a Senior Lecturer at the University of Neuchatel in Switzerland. We hear she has a pretty sweet lake view from her living-room window, and is happy to host visitors. While here at Caltech, Stefanie worked on leaf-wax D/H proxy records of Holocene climate change in the Swiss Alps. In particular, she has been combining lake-sediment D/H records with sedimentologic records of flood frequency. Peter Douglas has joined the research group, having recently finished his PhD with Mark Pagani at Yale. He will be working with myself and John Eiler on using clumped-isotope thermometry of methane to investigate sources of permafrost methane release in the arctic.